I usually don't discuss anything with my dentist while she's working on my teeth, but when she started telling me about a great film she'd just seen about avant-garde jazz musician Sun Ra, everything stopped. She could see she'd touched a nerve (so to speak), and she put down her tools and we started to talk. This was the early 1980s, and since she knew I was an aspiring documentary filmmaker, she thought it was her duty to point me in the right direction. She had discovered the films of Robert Mugge, and she instructed me to do the same. She'd always been right about oral hygiene, and she was right about Mugge. After screening several of Mugge's films about American roots music, I could see why she was so moved. Many music docs either follow a predictable story arc of struggle for success, wastrel behavior and redemption, or rely on a straightforward concert/performance format. Mugee digs deeper to find (no apologies to VH1) the stories behind the music. "The best music docs tend to be ‘about' more than just music," Mugge observes. "Yes, it's essential that filmmakers honor musicians by presenting their art and ideas as honestly and effectively as possible. But I also believe that the best music films tend to place music-making in the context of a larger story." Mugge's films range across the spectrum of American roots music, from Delta blues odysseys to portraits of jazz musicians, gospel artists, Hawaiian singers and dancers, Tex-Mex rhythm and blues performers, bluegrass virtuosos and zydeco players. He even made a film about Bob Hope's World War II USO trips. When I called him at his home in Media, Pennsylvania, he was preparing for back-to-back retrospectives of his work that were being presented in Lafayette, Louisiana (Cinema on the Bayou Film Festival) and Jacksonville, Florida (Springing the Blues). Mugge grew up listening to roots music as he accompanied his parents on their academic and career migration from the Southside of Chicago to North Carolina and the suburbs of Washington, DC. While inspired by gospel, country, rhythm and blues, and soul, Mugge made his first documentary about an Appalachian mining town, when he was a student at University of Maryland. From there, he went to Philadelphia for graduate school. But he was impatient. "I only stayed for a year because at that time, it was five years of course work and then maybe make a 15-minute thesis film, whereas as an undergraduate, I had already made a 50-minute documentary for the National Endowment for Humanities. I thought, I'm not sticking around." He took a series of jobs and set his sights on writing screenplays and making feature films. "I loved music so much that it was fun to do little music films on the side, and music docs," he reflects. "And it's the music docs that took hold. I'm doing something I love to do and I've been doing it ever since, feast or famine." As he struggled to find his way as a filmmaker, he launched the Sun Ra project. "With that one, I did something that you can do once in a career-make a film without money because you live off of your friends," he says. "It's really hard to do that a second time. It was a labor of love." The lack of money meant it took him longer to finish than he'd hoped, but the success of Sun Ra: A Joyful Noise (1980) opened other doors and helped to establish his reputation as someone who can make films about music and musicians. 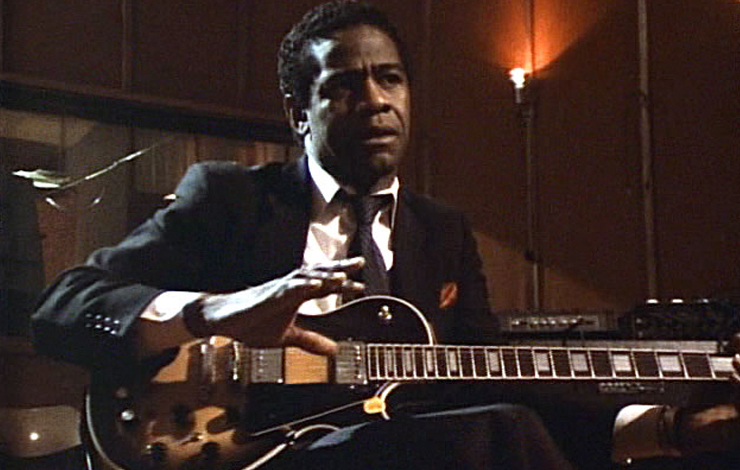 A rapid succession of films followed, including Gospel According to Al Green (1984), a portrait of the soul singer who left a lucrative recording career, bought a church and turned to preaching. Mugge's increasing notoriety didn't immediately open this door. "I had to chase Al Green for 13 months before he agreed to make that film," he admits. "I made two trips to Memphis, one to New York and one to New Orleans to meet with him." He was hitting the film festival circuit while he pursued Green. That's where he found an outlet and the financial backing for the film with a then-new broadcaster, Channel 4 in the UK, which later financed several of his films. Chasing the elusive Green finally paid off. "He finally said ‘yes' days before it had to be done because it was the seventh anniversary of his church," Mugge relates. "I knew from the research I'd done that the seventh anniversary is the pastor's day and it's a very important occasion for celebration." What followed was a look inside a person's life who'd dropped below the cultural radar. We see Green singing gospel songs at Dover Air Force Base, trying to wring every bit of excitement out of his renditions, as he once did when he performed his love songs before sold-out stadiums. Green's decision to forsake the secular for the sacred was more than a disappointment to some. This becomes clear as we follow Willy Mitchell through the dilapidated remnants of Hi Records, where Green recorded the majority of his hits and enabled Mitchell to build a robust stable of Memphis-based soul artists. The scene ends with Mitchell sitting in his nearly empty office listening to Green's "Let's Stay Together." "Making nonfiction film is not just about taking a lot of old, existing footage and re-cutting it," Mugge explains. "Sure, there are films like that and they serve a purpose. To me, a documentary filmmaker should be documenting things that are an essential part of our culture." It's not celebrity-saturated pop culture that interests him. "In music alone are we going to leave miles and miles of footage of Britney Spears and none of [Delta bluesman] Junior Kimbrough or none of the Rebirth Brass Band? Who was more important in this time? Not just socially, not just in terms of popular culture, but who was doing more interesting, more creative work?" Mugge's concern that some of these communities won't be around much longer has driven him to document endangered American roots music, as an unofficial "keeper of a culture." He's found that these musicians' stories illuminate themes that reach beyond their performances. "The best music films tend to place music-making in the context of a larger story, whether that story involves personal growth, struggle or challenge, social interaction, politics, religion, or whatever else appears to be most relevant." To Mugge, Gospel According to Al Green is not just about the connections between soul music and gospel, but "also about a talented Memphis singer going through a breathtaking spiritual crisis." Similarly, The Kingdom of Zydeco (1994), his foray into Cajun culture, is not just about a battle between two prominent musical families, but also "about the patchwork of traditions that bind together the Creole community of Southwestern Louisiana." His journey to discover the story of the Hawaiian hula, Kumu Hula (1989), is not just about attractive islanders performing chants and dances for uncomprehending tourists, but also "about surviving members of an ancient culture trying to preserve and extend their endangered beliefs and customs." When Hurricane Katrina hit, Mugge immediately embarked on New Orleans Music in Exile (2006), which is not just about musical diversity in the Crescent City, but also about "attempts to reanimate that city and its celebrated music community after both were decimated following Hurricane Katrina." All of which might be misconstrued as the traditional territory of ethnographic filmmakers, but Mugge rejects the formal academic restraints that shackle anthropologists who use film to examine vanishing cultures. "I don't think in America you can really do what they do when they go and find some tribe in the rain forest that had no relationship with the rest of the world. No place in America has that been the case." He recognizes the multicultural influences that have shaped the lives of his subjects. He discovered in Hawaii that even this isolated island culture had been affected through the years by outsiders who came in and made it all the different things it is today. Mexican vaqueros brought in their cattle, and their guitars, while Portuguese traders brought an instrument that Hawaiians later named the ukulele. "It's all this stuff that's fascinating to me," says Mugge. "The blues to me is fascinating not because it's out of some pure strain of music and culture that came from Africa. It's about how Africa and Europe came together in the American South under particular circumstances in a particular terrain with particular relationships between whites and blacks in south Louisiana, French and Caribbean and all this." Whether he's shooting a traditional hula dancer or a Delta blues diva, Mugge sees his mission as extending beyond simply capturing a performance. Instead, he uses the best recording technology available. "I'm going to put it, whenever possible, on 24-, 48-track and remix it so that it sounds the best it can be," he notes. "I'm going to film with multiple cameras, so I'm going to try to present [whom I film] as well as the Rolling Stones or the Who." He turns to many of the same camera operators and sound recordists he's been working with since he started his filmmaking journey. "It's important to establish this metaphor of this jazz group," he maintains. "It's probably more true with nonfiction films than with fiction films, for you are improvising as you go and interacting with real events and real people. Your crew is like an extension of you, and you are doing all this every bit as much as in a musical ensemble in particular jazz." This jazz ensemble approach relies a bit on telepathy as the crew riffs on how they capture an event, but it also relies heavily on years of collective experience-which is why Mugge is hesitant to bring in new crew people. "I'm sure they're technically great, but they didn't make 20 other films with me," he points out. "They don't know what we do when we get inside a situation." But it's all about storytelling. "I think all of us documentary filmmakers in the end are storytellers who document, We go out and we find what's out there and we tell what we see as the most interesting stories that we found out there. That's certainly what I'm trying to do." Michael Rose is a writer/producer/director.